Arduino Blog » “Hack the Arduino Robot”: join the competition! Are you using the Arduino Community Logo? Share it with us! RobotChallenge is an international championship for self-made, autonomous, and mobile robots taking place in Vienna (Austria) since 2004. Each year robots compete in different competitions – Robot Sumo, Line Follower, Air Race, Humanoid Sprint, Puck Collect and Freestyle . This year RobotChallenge in cooperation with Arduino and RS Components presents a new open source competition called: “Hack the Arduino Robot!”. What would you do with an Arduino Robot? What real life problem does your robot solve? An international jury will select the 10 best project ideas based on feasibility, creativity and innovation. 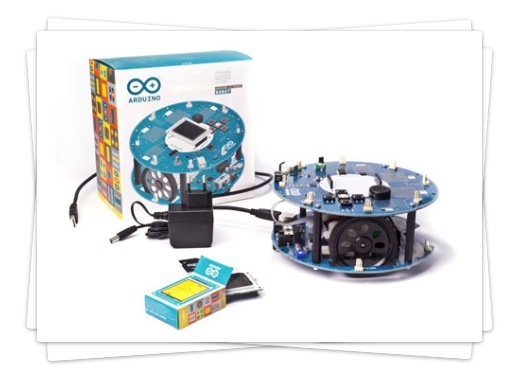 The selected teams will receive a brand new Arduino Robot for free to implement their project ideas and are invited to present their robots at RobotChallenge 2014 on 29th and 30th of March. Open source is all about sharing with the community: Therefore each team has to document their project online and submit a short video (3 – 5 minutes) by the 23rd of February. Do i need to pay in the website for this contest. Or just registering is enough? Yes, the challenge available for a fee of 29EUR. And they never, ever, ever gave any award. Just a stupid paper and trophy or a plastic medal. Cheap trick. And they take fees avery year. Yes, at least I got an email and yesterday, the robot kit also arrived. Good luck!